Are elephants the new steadycams? Or the new paparazzi? (elephrazzi?) 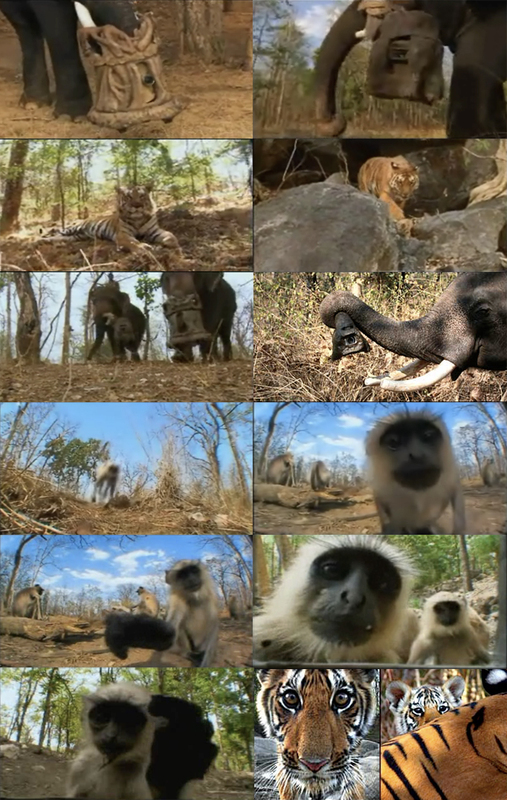 Are spy cam technologies finally being put to good use to capture incredible new nature footage? Does a tree trunk rendition of R2D2 really slip under a tigers radar as it rolls around the jungle floor? A remotely-operated trunk-cam, which could film while the elephants were on the move and could also be set down. A remotely-operated tusk-cam, which was smaller than the trunk cam and could be carried by the elephants for much longer periods. 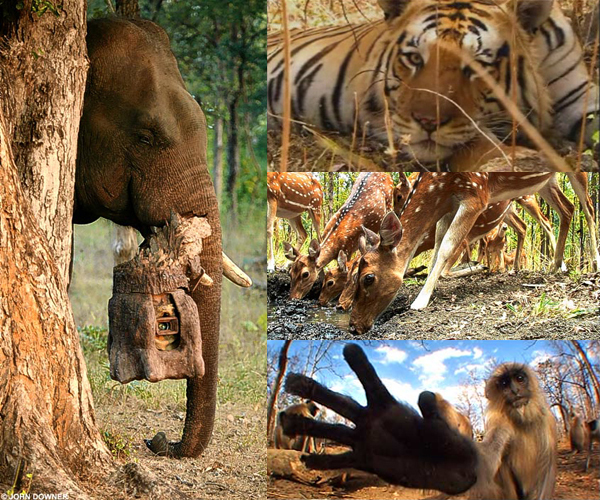 Log and rock cams - cameras disguised as logs or rocks - which could be set down either by an elephant or human crew member and were activated by motion sensors. Like everyone I am searching for the DVD. hey does anyone know the name of the song that plays on the oppening of the show? Deepak - Wake up man, this is no computer animation. Are you human or a robot yourself!!! Get eral and get with it! The most wonder-full nature wild-life programme yet! Loved the show but i recorded it and the last 2 minutes or so got cut off. at the end the narrator says something about great news and i was wondering what she said because it got cut off. not about how the tigers are still on the reservation but after that? that was without a doubt the best t.v series i’ve seen for along time, enjoyed greatly. please tell me where i can buy the dvd set of the tigers. Absolutely beautiful show - I’ve been watching it the last couple of weeks on our local station & can’t wait to see the 3rd show. Such beautiful creatures! Such wonderful photography and ability to see into their world. I’d love a copy of it. Excellent work. when is Tiger Spy in the Jungle going to be on BBC America? My wife made me watch the first episode and I was hooked, fantastic camera work by the elephants a truly amazing programme. Well done the BBC and Sir David Attenborough putting such a great series together.. LONG LIVE THE TIGERS. Wonderful programe about wild tigers, watching those four beautiful cubs growing up was truly an honour to see. Also seeing how their mother took care of them, making sure her babies were feed and safe 24/7, was true girl power in my book. I was also trilled to see that a new generation of tigers had been born at the end of episode three. P.S Charger is also a beautiful animal! Hi, also here in the Netherlands (Eindhoven)I enjoyed all the three episodes. And I was realy relieved that the cubs survived as well did their mother. For me it is the best wild life program I ever have seen! Thanks BBC! Is this series going to be available on DVD - I was supposed to record it for my parents (who are on holiday) but can’t fathom out how to use the DVD recorder! Perhaps I should get a monkey to do it! Is this a joke. Some of the shot I can tell were defenetly computer made. Hi all, This is really wonderful program. My home town is Nagpur and it is around 50 miles from Pench National Park and I have been there twice or thrice but it is really amazing so see Pench through CAMS. I have never seen pench like this. Thanks to BBC and whole team. oo this show was so good. The best nature program i have ever seen! Well, the episode has just aired, it was beautiful. Once again David Attenborough’s voice takes you on a journey through the wonderous miracles of our world. I’m looking forward to seeing the second episode. Cheers to the crew and a hoorah for BBC’s excellent broadcasting choice! yeah, i remember that on discovery. the elephants became pretty aware that the little camera-bots were watching them and started carrying them around. crazy elephants. could you explain a bit more about how the elephants and the people work together to place the cameras? Can the researchers monitor the photos and manipulate the cameras remotely?